I fell in love with Tish from the moment I first saw her, almost 14 years ago to this day. 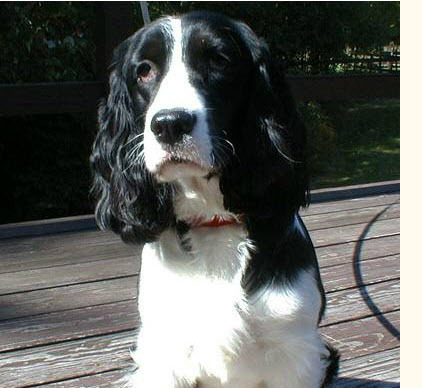 She was a happy three-month-old Springer puppy: the only one of her litter who was still available from her breeder, Sue Sutton of Woodlander Kennels in Maine. I wasn't sure why Sue hadn't already sold her, but when I saw her, I knew: Tish was supposed to come home with me. And from that day to this, Tish rarely left my side. She was a shy girl who didn't mix well with crowds of people. In that way, I guess, we were a perfect fit. On the day I met Tish, Sue mentioned that from the time she'd ventured outdoors, Tish loved to meander through the garden, biting off the blooms of all the flowers she could find. I laughed off this quirky behavior, until Tish did it in my garden, too. It didn't matter, though, because there was little mischief Tish could do that wouldn't earn my instant forgiveness. And when I made mistakes, Tish was quick to forgive me, too. When I brought Tish home on a beautiful May afternoon in 1998, life seemed so full of hope, of promise. 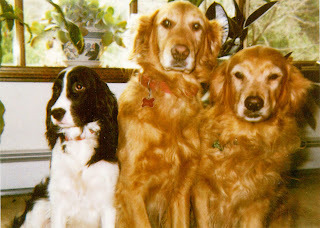 Tish's exuberance made it easy to believe that our best days were yet to come. 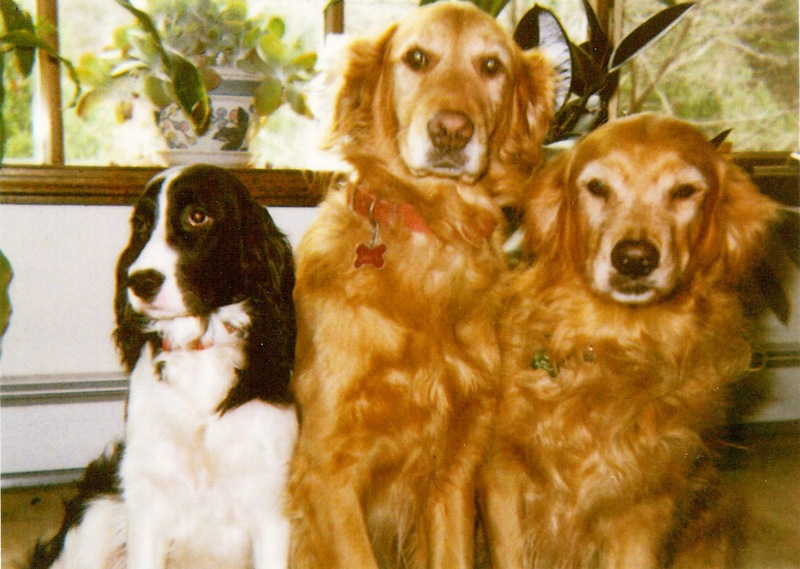 She became the youngest child in a family full of dogs, fitting in beautifully with older Golden Retriever sisters, Ashley and Lady. And as the self-appointed ambassador of her breed, she welcomed the other homeless Springers who I brought into the fold: Trudy, Randy, and Liam. They've all passed into spirit, and now, so has Tish. For the last several months, I tried to ignore the signs that Tish was not only slowing down, but her body was giving up. Her eyes became foggy and her ears seemed full of cotton, but I told her each day, as I hugged and caressed and kissed her, "I will keep you safe and take care of you, no matter what comes." But a series of chronic infections seemed to knock her out with each succeeding recurrence, and by early spring, it was clear that even with treatment, they were taking their toll. Still, as long as I had Tish, I had hope. In the last few weeks, that hope had begun to wane, though I couldn't bring myself to admit it. There were so many little signs. Once a voracious eater who barked for her food dish each night, Tish halfheartedly picked at her meal. Once eager to dash through our boundless backyard, Tish now tiptoed tentatively, nervous lest she lose sight of me. Though she'd always napped next to me while I worked at the computer, she now stayed upstairs, fearful of falling down. She often seemed vaguely uncomfortable, though it was difficult to pinpoint exactly why. But Tish soldiered on. And perhaps it was I who was blind, not fully recognizing what I did not want to see: that Tish was slowly, inexorably, dying in front of my eyes. And that's why it was such a shock when, at 2:30 this morning, I was awakened by her cries. She'd somehow fallen down the stairs and landed in the sun room, and as I rushed to her side, I saw that she was disoriented and uncoordinated, unable to stand. I scooped her up in my arms, and brought her back upstairs, imagining for a moment that I would bring her to the vet's office the minute they opened, so they could patch up whatever had gone wrong. Within minutes, though, it became clear that Tish was already in the process of leaving her beautiful black and white body, and all I could do was to hold her and stroke her and tell her how much I loved her, knowing that her ears could not hear me but hoping that her heart did. And then, even as I was trying to grasp the enormity of what was happening, she was gone. All of us who love dogs are wont to say that we hope our canine companions will "die in their sleep" so that we won't have to make the dreadful decision to help them pass out of their bodies. Just yesterday, I had found myself thinking that to do that to Tish would feel like killing her. I knew I would never be able to do it. I have to wonder if she heard me, and decided to spare me the anguish by making her passage quickly and without warning. What I know now is that it doesn't matter whether the death of a beloved dog comes at home or in the doctor's office: it is still excruciating for the people left behind. But not for Tish, who controlled her own destiny, right to the end, choosing to make her exit the same way she lived her life: privately, bravely, and with me by her side. Yet through my tears, I keep asking myself what more I could have done, should have done, to forestall this day. I never wanted it to come. Beautiful, Maureen. You gave Tish everything you had and she also gave you much in return. Allow yourself to grieve her passing.